Vajradhara (Tib. 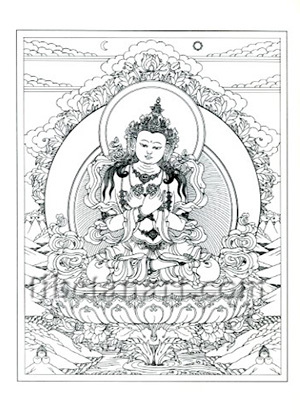 Dorje Chang), the 'Holder of the Vajra', is the primordial Adibuddha of the Tibetan Sakya, Kagyu and Gelugpa schools, the Dharmakaya aspect of the Buddha who manifested in order to transmit the tantric teachings. Vajradhara is the Sixth Buddha, or Lord, of the Five Enlightened Families, and in the Kagyu tradition he is recognized as the source of the Mahamudra teachings that were revealed to the first human guru, Tilopa. Vajradhara is dark blue in colour, and with his arms crossed in vajrahumkara-mudra he holds the method and wisdom attributes of a vajra and bell in his right and left hands.